New Pew Research Finds Gulf Between People People’s Hunger for Local News and their Satisfaction with Local Media. People are hungry for local news and they follow local issues and debates closely. I’ve seen that in my daily work with newsrooms and communities in New Jersey and New York and it is reinforced in a new report on “Local News in a Digital Age” just released by the Pew Research Center. 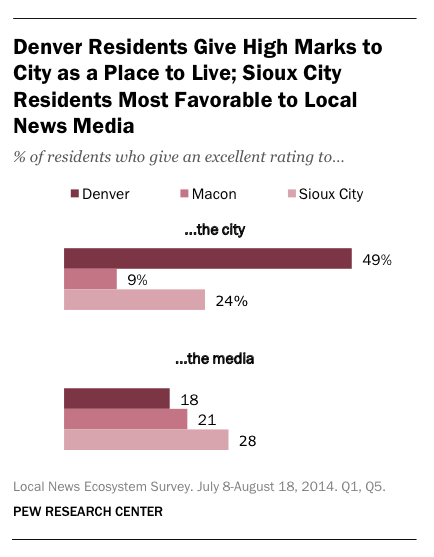 Using surveys, news content analysis and interviews the study attempted to map the local news ecosystem and trace the ebb and flow of news through three very different cities: Denver, Macon and Sioux City. Across the board, the researchers found that “Nearly nine-in-ten residents follow local news closely — and about half do so very closely.” That’s the good news, and it adds to the evidence that local news is still of vital importance to people, even as many journalists struggle to find new ways to pay for that reporting. However, the report also suggests important areas where local newsrooms — and especially local digital news entrepreneurs — can and should to do more to meet the diverse needs of their communities. These lessons are particularly relevant to the work we are doing at the Geraldine R. Dodge Foundation to strengthen and expand the local news ecosystem in New Jersey. The Pew report found that race and ethnicity are “one of the greatest divides in news habits.” In Denver and Macon people of color follow community news at higher rates than white residents. In Denver, the researchers found 9 outlets specifically serving the Hispanic community there, whereas in Macon they found only one newsroom serving the large African American community. The report didn’t assess how the other mainstream outlets are serving these communities but they did find that amongst the entire population, only 18% of Denver residents and 21% of Macon residents are satisfied with the local media ecosystem. For me, one of the key findings is this huge gulf between people’s high level of interest in local news and their low satisfaction in local news. Our communities crave access to relevant, timely, useful local information and news but right now our local news ecosystems are not meeting that need. Closing that gap has to begin with creating local media that better reflects the diversity of our communities. But it also calls on us to think more broadly about the services we provide. That is an exciting opportunity for the future of journalism and an important challenge for civic life in our communities. Elsewhere in the research the authors report that in general, civic engagement corresponds with news consumption. “Civically engaged residents are more connected with their local news and are drawn to a more diverse set of news sources,” the authors write. In addition to following the news at a greater rate, blacks and Hispanics specifically also expressed “a greater sense of agency when it comes to improving their community.” We have to understand that news is a civic tool and our communities are eager to put it to use. The Pew report found that most local news outlets are not engaging citizens creatively or deeply as part of their journalism. “Citizens are a part of the news process, but mainly as quoted sources or as disseminators of news in social media,” the report notes. The research focused on fairly established modes of engagement with news beyond sources and distribution — submitting content, calling in to radio shows, commenting on a blog — but even these actions came in very low. Deeper models of engagement like crowdsourcing, events, citizen-driven beats, hands on journalism, and open editorial meetings were not even explored as far as I can tell. For all the attention community engagement has received in journalism discussions over recent years, we still have a long way to go in thinking about how local newsrooms can build community around the news, encourage participation, and open themselves up as a resource for local people. Given that the report found an alignment between civic engagement and engagement with local news there is an opportunity to marshal the creativity and energy of these engaged citizens to strengthen local media. But, it is not enough to only reach out to the already engaged. In thinking about new forms of engagement we should embrace the challenge of using new models to welcome in new people. And we should recognize that some of the best ideas for how to do that likely exist within the communities we want to reach, not within our newsrooms. The report also highlights how unique local communities have different ideas about what they need and want from local news. Each city had different priorities for the topics they wanted to see covered, reminding us that local news isn’t ever one-size-fits-all. That finding was reinforced by other parts of the report. Indeed, in places with greater internet access and where more people are engaging with local news online and via social networks their experience of news is fundamentally different. “In more wired cities news may literally travel faster” the authors write. For those of us in newsrooms, education, philanthropy and community who are working on expanding local news and supporting new journalism entrepreneurs, this finding is important. We can and should create new networks to share resources, lessons and foster collaboration. But we also need to be helping journalists develop tools and strategies for identifying and address unique community assets and needs. We need to encourage more listening and empathy, and understand how to map the local factors that are shaping our communities. After decades of local news being defined largely by chain newspaper ownership, we need to embrace and respond to the uniquely local character of our communities and develop services that meet them where they are. The Pew report complements other recent reports on local news, like theFCC’s Information Needs of Communities and Duke University’s The Goat Must Be Fed. It is particularly useful in its deep exploration of local news outside of the major media markets on the east and west coasts that often get a lot more attention. I’ll be interested to see how local journalists and residents in Denver, Macon and Sioux City respond. Hopefully the report can serve as a useful catalyst in bringing together diverse coalitions of people and organizations who are interested in working together to expand what’s working and tackle what’s not. In New Jersey, we are trying to develop strategies to help local newsrooms expand the kind of work outlined above with a particular focus oncommunity engagement and revenue sustainability. Our ecosystem is knit together by an incredible collaborative experiment called the New Jersey News Commons at the Center for Cooperative Media at Montclair State University where more than 120 local newsrooms are members. That model may be of use in other areas. The findings in the Pew report will help inform that work but we are also working with a team of researchers at Rutgers University to explore some similar questions about the news ecosystem in our state. We’ll share the findings from that work later this spring.